Stir marinade ingredients together. 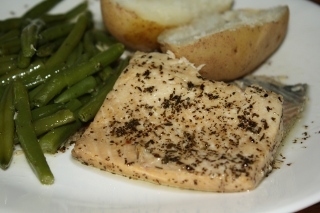 Place salmon fillets in glass dish and cover with marinade. Marinate in refrigerator about 1 hour, turning occasionally. Preheat oven to 375 degrees. Cover dish with foil. Bake 30 minutes or until they register 135 degrees and easily flaked with a fork.